These are lyrics by Aqua that we think are kind of nonsensical. Aqua's, "Happy Boys And Girls"
ok, I know that English probably isn't Aqua's first language, but this is just ridiculous. Try what with an eagle? Warm what? 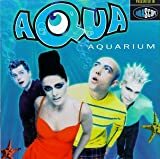 I love Aqua, but this makes absolutely no sense at all!